Grubs, And What To Do…. If you have brown spots in your lawn, even with all the rain we’ve had recently – if you can reached down and grab a handful of grass and pick it up, roots and all, like your uncle’s hairpiece…you probably have grubs in your lawn. What are grubs? Well, grubs are worms that feed under the surface of your lawn and they eat the roots off your grass plants. And when they do they make the plants die, of course, and generally create a mess because you can’t mow, or even walk across the lawn with out chunks of turf coming up. And if those chunks do come up…you can look right there and see the culprits – those gray/whiteish looking worms lying just under the roots. What to do about it? Well, it’s best to contact a professional and have your lawn treated to kill the worms. The pesticide that’s used is highly toxic, so it’s probably not something you want to handle yourself. The second step is to aerate and reseed this fall – now, even – so there’s time for new plants to root and come up green and healthy next spring. If you don’t you’ll have dead spots, which will become mud spots, which will eventually become patches of weeds and crabgrass. 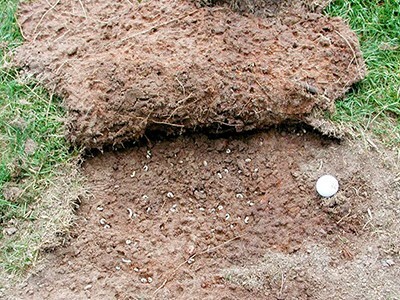 And by the way, grubs are a common problem with turf. They’re associated with Japanese beetles (and we’ve had a bad year for beetles) so it’s no surprise that many area lawns are now turning brown and coming up in clumps. If yours is one of them…call Ever-Green. The solution is simple, and timely, and now is THE TIME to deal with grubs. If You Have To Mow Wet Grass…. There’s Nothing Wrong With Spring Nitrogen…. The Perfect ‘Late’ Holiday Gift…And $ave Money! What Could Be More Blessed Than To Give….? Privacy Statement: Ever-Green "does not" sell, or share, its customer list with other retailers or marketing entities! Privacy Statement: Ever-Green "does not" sell, or share, its client list with other retailers or marketing entities!